A photosession is held with DA on the streets of a Santa Ana subdivision for the cover of Horrendous Disc. Larry Norman is the photographer. 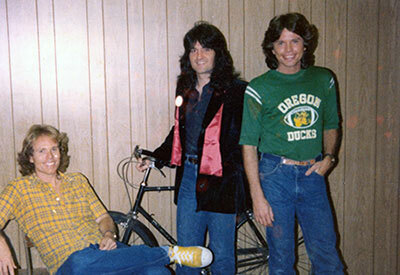 The actual cover photo was taken on Flower St. in Santa Ana, near the corner of Santa Clara. 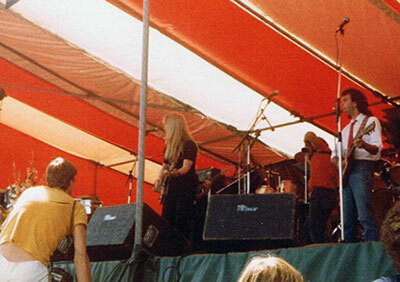 Larry Norman's Roll Away The Stone is released on Phydeaux Records. Alex MacDougall played drums. Tamarack's 45 single "Eagle"/"Part of Me" is released. 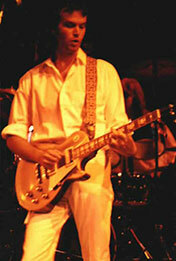 Future DA keyboardist Rob Watson is a member of the band and also cowrote "Part of Me" with Catherine Holt Spurr. Daniel Amos performs in California at Disneyland for "Contempo '80". 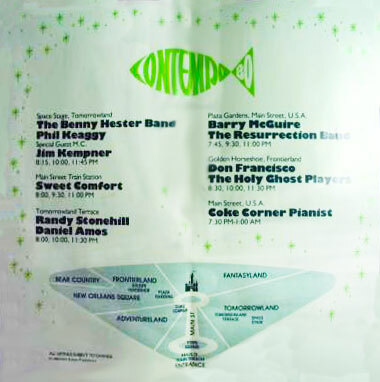 Other performers include Randy Stonehill, Phil Keaggy, Benny Hester, Sweet Comfort Band, Resurrection Band, Barry McGuire and others. Daniel Amos performs at Duarte High School in Duarte, CA. Becky Ugartechea's Look By Faith is released on Maranatha! Music. Alex MacDougall played percussion on the album. Daniel Amos performs at Capistrano Beach High School in Capistrano Beach, CA. Daniel Amos performs at Capistrano Valley Baptist Church in San Juan Capistrano, CA. The Rock and Religion Radio Show airs the first half of a special on DA's Horrendous Disc, featuring an "interview" with Terry, Ed and Jerry. This was the first chance the public had to hear music from the delayed record. 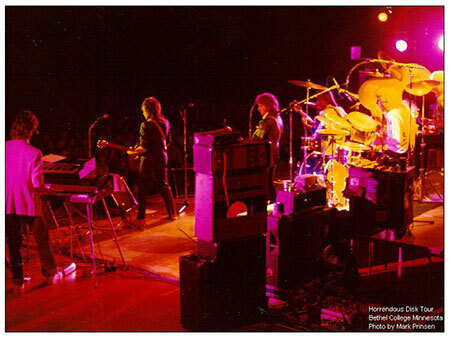 The show featured "I Love You #19", "I Believe In You", "Hound Of Heaven", "(Near Sighted Girl With Approaching) Tidal Wave", and "On The Line." Daniel Amos performs at the Broadway Tabernacle in Vancouver BC with Randy Stonehill. Gossip and rumors were spreading about the band which were causing a lot of difficulty while touring. 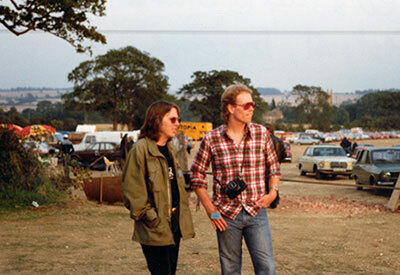 Terry: "...we'd go out (to play concerts), and the rumors would precede us. People would think that we were doing everything from divorcing our wives to using cocaine, and I don't know what else. Because once there's a sense of controversy here (in the Christian Music world) the rumors just fly." Larry Norman fed many of the rumors in the years that followed with a number of unfortunate mistatements, including the following line from an interview in CCM Magazine. This sentence led many to speculate that members of DA had left their wives in the late 70's. In reality, only three members of DA were married at the time - Terry, Ed and Mark. None of the three were getting divorced. Mark Heard and Tom Howard were also both happily married. 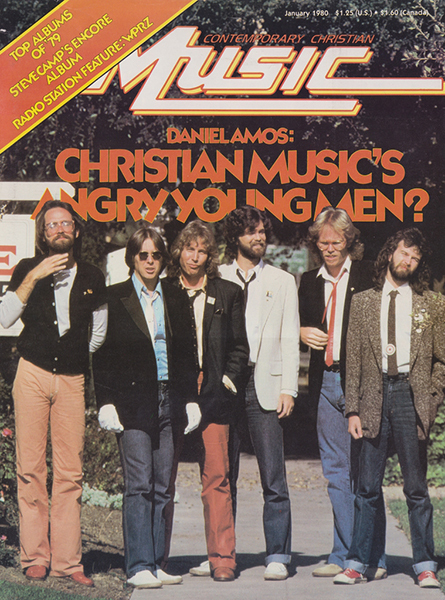 Daniel Amos appears on the cover of CCM Magazine. "Angry Young Men"
Refuge Records is founded. A few years later, Refuge would release DA's Vox Humana album. CCM magazine's "Record Rap" column says that there's still no definate release date for "Horrendous Disc". Daniel Amos performs at the Whisky A-Go-Go in West Hollywood, CA. 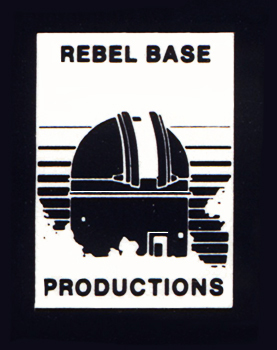 Rebel Base Productions is formed with Tom Howard. 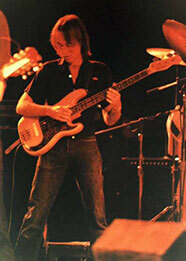 Tom Howard: "There's a little rehearsal studio and office in Santa Ana, California that DA has been using for years. When a popular science fiction movie (Star Wars) came out and the good guys were holed up at the "rebel base" the name drifted over to the studio and it stuck.... it's the whole idea of rebeling against a strong, powerful force of evil." Daniel Amos performs at the Coo-Coo's Nest in Costa Mesa, CA. Daniel Amos performs at the National Entertainment and Campus Activities Association Convention in Washington, DC. Alex MacDougall plays drums on "Look By Faith," the second album from Becky Ugartechea. Daniel Amos performs at Irvine High School in Irvine, CA. Daniel Amos performs at in Santa Barbara, CA. Daniel Amos performs at the Filmore in San Francisco, CA. Daniel Amos performs at California Lutheran University in Thousand Oaks, CA. Daniel Amos performs at La Verne University in La Verne, CA. Daniel Amos performs in El Cajon, CA. Daniel Amos performs in Escondito, CA. Daniel Amos performs in Springfield, MO. 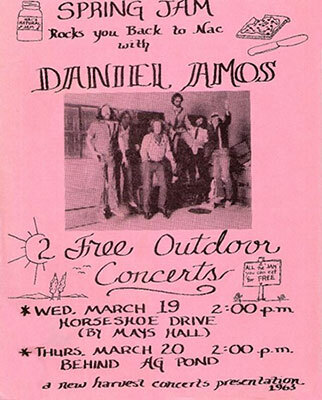 Daniel Amos performs at Stephen F. Austin State University near Mays Hall in Nacogdoches, TX. Daniel Amos performs behind AG Pond in Nacogdoches, TX. Daniel Amos performs in Fort Worth, TX. Daniel Amos performs in Longview, TX. Daniel Amos performs near Houston, TX. Daniel Amos performs at the Houston Music Center in Houston, TX. CCM magazine lists several new releases, and makes note that Horrendous Disc isn't one of them. Daniel Amos performs at Bethel College in Roseville Minnesota with Randy Stonehill. Daniel Amos performs in River Falls, WI. Daniel Amos performs St. Paul, MN at Bethel College with Randy Stonehill. Daniel Amos performs at Judson College in Marion, AL. Daniel Amos performs in Pigeon, MI. Daniel Amos performs at Malone College in Canton, OH. Daniel Amos performs in Peoria, IL. Daniel Amos performs in Greenville, Illinois at the Agape music festival. Daniel Amos performs in Eureka Springs, AR. Daniel Amos performs in Ottawa, KS. Daniel Amos performs in Bucklin, KS. Daniel Amos performs in Denver, CO.
Daniel Amos performs at the National Entertainment and Campus Activities Association Convention in Grand Junction, CO.
Daniel Amos performs in Grand Junction, CO.
DA finishes their tour and returns to California to find a letter waiting from Larry Norman, stating that he had released them from their management contract with StreetLevel. California Civil Law states that it is illegal for the same company to receive compensation for booking and management of an artist. StreetLevel Artist Agency (with Phil Mangano) splits off from StreetLevel Productions. Daniel Amos performs in Sacramento, CA. Daniel Amos performs in Chico, CA. Daniel Amos performs at Club 88 in Los Angeles, CA. Daniel Amos performs at LA's historic rock Madame Wong's in China Town. 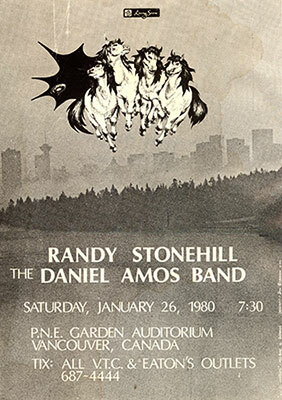 The club regularly featured a who's who of rock and roll in the early 80s including The Knack, The Police, Fishbone, The Go-Go's, Oingo Boingo, Guns N' Roses, Red Hot Chili Peppers, The Ramones and others. Daniel Amos performs in Modesto, CA. Daniel Amos performs at Gazarries on the Sunset Strip in Hollywood, CA. Randy Stonehill's The Sky is Falling is released on Solid Rock Records. 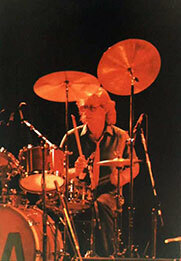 Alex MacDougall played percussion and drums on the album. Daniel Amos performs at the Blue Lagoon Saloon in Los Angeles, CA. Daniel Amos performs at the Bla Bla Caf� in Studio City, CA. Daniel Amos performs at the historic rock club Madame Wong's in West Los Angeles, CA. Daniel Amos performs at Sweet Water in Los Angeles, CA. Solid Rock meeting between artists and management. 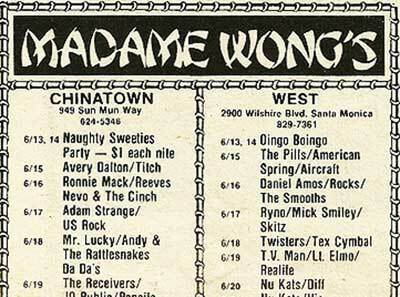 Daniel Amos returns to Chinatown's historic rock club Madame Wong's in Los Angeles, CA. 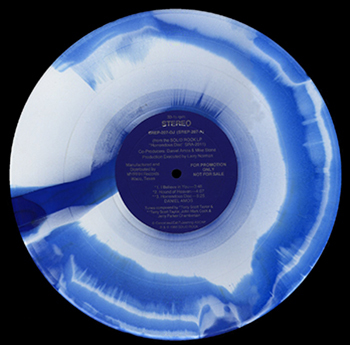 Word radio promo man "dangerous Dan" Hickling releases the 10" Horrendous Disc ep to radio stations, with Blue and White swirled vinyl. Side one (33 1/3 rpm) features "I Believe In You," "Hound of Heaven" and "Horrendous Disc." Side Two (78 rpm) has the flying saucer sounds, and "On The Line." There are also rumors that there is an alternate version of the EP. We know lots of people that claim to have seen one, or have a friend that has one - but so far, we haven't seen one ourselves. Solid Rock tells us that there's only the one version. Daniel Amos performs at Calvary Chapel in Costa Mesa, CA. Daniel Amos performs in Oceanside, CA. 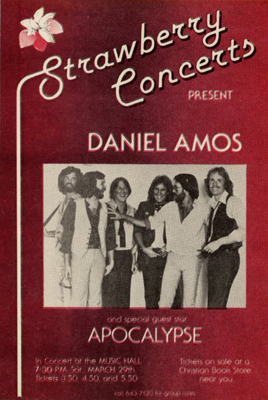 Daniel Amos performs at the Concord Pavillion in Concord, CA. at. 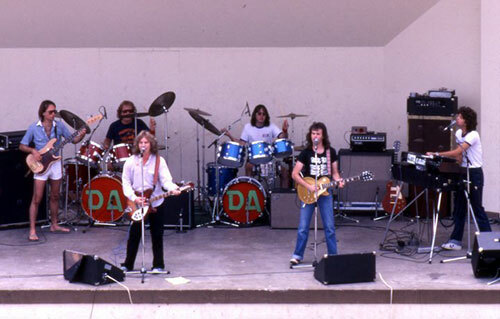 The show's lineup was Chuck Girard, Resurrection Band, DA, and Servant. Daniel Amos performs once again at the historic rock club Madame Wong's West in Los Angeles, CA. 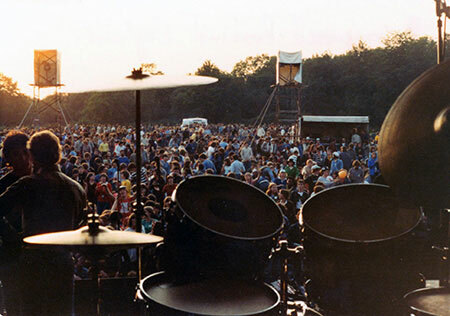 Daniel Amos performs in Holland at the Kamperland Music Festival. 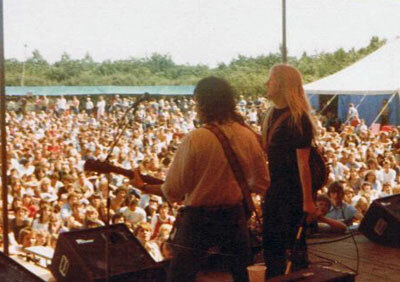 Daniel Amos performs in Holland at the Kamperland Music Festival, with Larry Norman and the Sam Scott Band. Due to illness, Terry had to miss the performance. 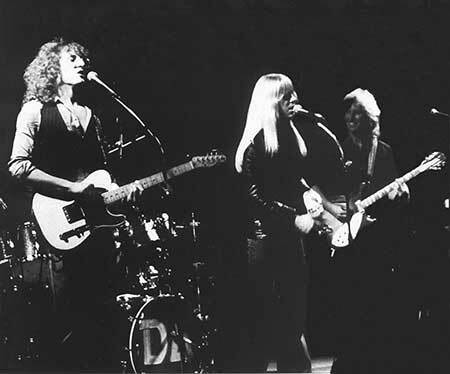 Larry Norman filled in on lead vocals for DA. Daniel Amos performs in England at the Greenbelt Festival. 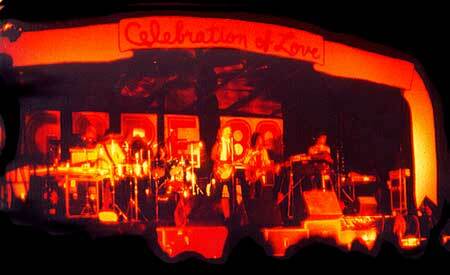 The band arranged for a free performance for all the hotel workers and townsfolk friends in Bedford, England. The gathering quickly outgrew the hotel where they were staying, so they moved it to the largest public place they could find on short notice--the local pub. Daniel Amos performs in Dartmouth, MA. 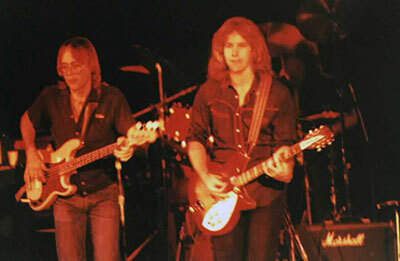 Daniel Amos and Andy Pratt perform at R.I. College in Providence, RI. Daniel Amos performs at Gordon College in Wenham, MA. Daniel Amos performs in Bangor, ME. Daniel Amos performs in Augusta, ME. Daniel Amos performs in So. Yarmouth, MA. Future DA Keyboardist Rob Watson records a demo entitled "Relaxing in Camarillo" with his band Tamarack. Watson also cowrote music on the demo. Daniel Amos performs in Mt. Wachusett, MA. Daniel Amos performs in Buffalo, NY. Daniel Amos performs at Houghton High School in Houhton, NY. Daniel Amos performs at Houghton College in Houhton, NY. Daniel Amos performs in Rochester, NY. Daniel Amos performs at Toad's Place in New Haven, CT.
Daniel Amos performs at Cumberland College in Williamsberg, KY.
Daniel Amos performs in Greensboro, NC. Daniel Amos performs in Buies, NC. Daniel Amos performs in Woodland Hills, CA. Jerry Chamberlain marries Sharon McCall. 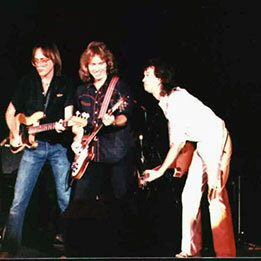 Sharon occasionally sang with the Scratch Band, a band from Sacramento that eventually evolved into the 77s. Daniel Amos performs at Nazarene Church in Pasadena, CA. 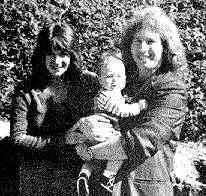 Terry and Debi's son Andrew is born. Daniel Amos goes on tour. (Can you help us fill in information for these dates?). Word Records Vice President Stan Moser informs CCM Magazine of the current status of DA's long-delayed Horrendous Disc. Moser indicated that Norman still had the legal rights and physical control of the Daniel Amos record. Stan: "Well, here's what we've got. What we have in our warehouse right now is, I believe, 25,000 jackets with the wrong songs listed on the back. And we have 10,000 8-tracks and cassettes of finished product that have only nine songs and I think there are ten songs that are supposed to be on the final album. So we've had those in our warehouse for about 90 days. Once we reached that stage, we realized that something was wrong somewhere. 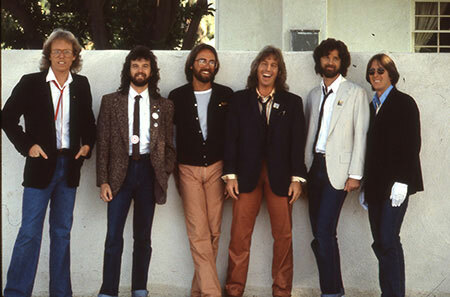 And then Larry informed us that the 8-tracks and cassettes were pressed from the wrong master tape, or created from the wrong master tape, and that he would furnish us with the finished master tape that would correspond, as I understand it, with the jackets we now have." Former Beatle John Lennon is shot and killed by a disturbed fan in New York. DA learns of the tragedy while working in the studio. (Terry touches on this tragedy in his article "Here I Am... There You Are ("Imagine No John Lennon")"
Daniel Amos performs in Napa, CA.